As we begin this discussion, it’s important that you realize a couple things about Big Bear hotels. First, they are mostly independently owned and operated, thereby creating a unique and charming array of lodging options for you. Sure, a few of the popular chain hotels have a presence in Big Bear — Best Western, Motel 6 and Quality Inn, for example — but many other places are family-owned lodges, inns and clusters of cabins. Second, the final entry in that list — the “cluster of cabins” — is an extremely popular form of Big Bear lodging. Let’s take as an example the Golden Bear cottages, not far from the dam at the west end of the lake. It’s composed of 29 cottages/cabins owned and operated by a single family, clustered together but all constructed in a different architectural style — from log cabin, to barn, to manor house and more. Some of these cabins allow pets; others are near the pool. Some offer multiple bedrooms. The setting seeks to establish both privacy and a sense of sharing a lovely vacation destination with a variety of other travelers. Timberhaven Lodge is another set of about 10 cabins, all clustered around a playground for the kids and a hot tub for the adults, which might be a bit different than how you’d picture a “lodge.” Another Big Bear cabins cluster actually calls itself a “ranch” — Pine Knot Guest Ranch — but it’s composed of “jacuzzi cabins” arrayed around a pool, with bunnies and llamas walking on the premises and available for kids to pet. There’s truly something for everyone in Big Bear! Some of the area’s “inns” and “lodges” are simply a large building with multiple rooms, each with a bath and some with a sitting room, and they’d probably more properly be classified as Big Bear hotels. Knickerbocker Mansion (named after the first dam keeper) is one such example. Another, Snow Lake lodge, has 20 one-bedroom suites (tucked in the trees; no lake views) that are especially convenient for skiing vacations. Northwoods Resort — by far one of the largest Big Bear venues — has 147 rooms and offers “conference center” amenities. Fireside Lodge has single rooms and suites for families and groups at an in-village location near marinas, shops and the movie theater. Marina Resort is a similar offering, but it’s located right on the lake. Sometimes only select rooms within these Big Bear lodging establishments are equipped with a fireplace, however, so make sure your reservation inquiry, request and confirmation specifies this feature. For people who prefer a bed & breakfast inn, there are Apples B&B and the Eagles Nest B&B Inn. There’s even a “hostel” near the village center (Big Bear Adventure Hostel) which offers a few rooms with bunk beds for less than $30 per person per night. All in all, your Big Bear hotel options provide a broad range of locations, amenities and price-points for enjoying a getaway or vacation. If you want access to village services, one of the lodges near the village would be best. 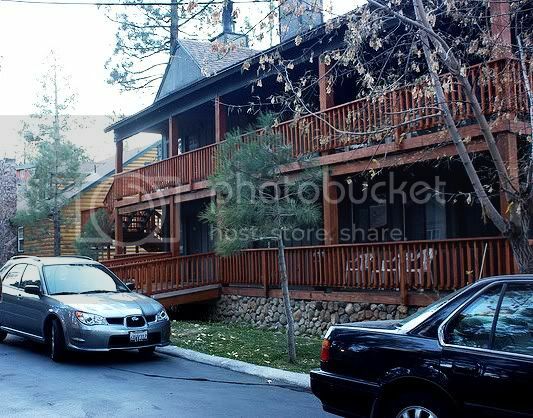 If you want a a little more privacy or autonomy with services still easily accessible, then we’d recommend you consider one of the “cluster of cabins” Big Bear hotels. And, for the really relaxing retreat, consider getting a standalone cabin, as outlined in the our Big Bear Cabins article. 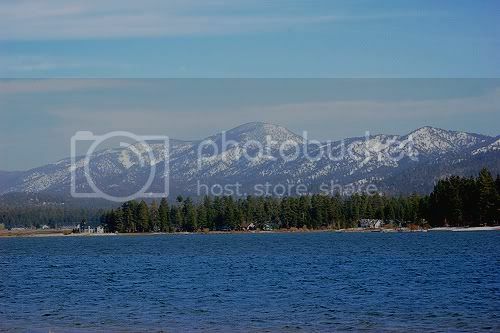 Photo of Big Bear Frontier Lodge on Main Street by donabelandewen via flickr (Creative Commons) and photo of Big Bear Lake by kewl via flickr (Creative Commons).